Brachycephalic syndrome refers to the combination of elongated soft palate, stenotic nares, and everted laryngeal saccules, all of which are commonly seen in these breeds. Because of these anatomical differences, brachycephalics often require extra time and care during and after their anesthetic event. Allowing the patient to sedate and recover in an oxygen rich environment will also benefit the brachycephalic patient. Oxygen therapy is beneficial prior to induction of anesthesia in animals that are at high risk for oxygen desaturation and when a difficult intubation is anticipated, such as brachycephalic breeds. Any animal with respiratory compromise may have a compromised FRC (Functional Residual Capacity) and benefit from preoxygenation. It is also important to have a dedicated nurse observe the patient during the recovery period. Brachycephalic patients often require a longer recover period than other breeds due to their upper airway issues such as stenotic nares and an elongated soft palate. 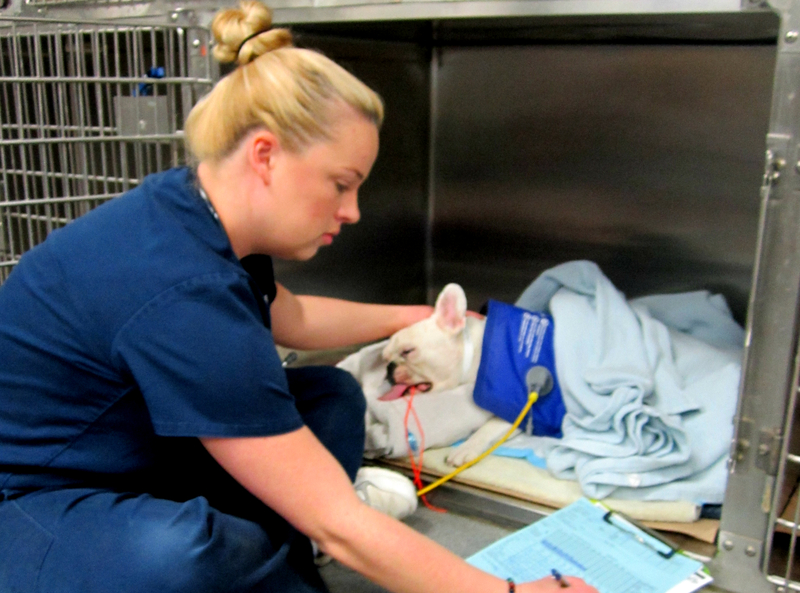 It is currently recommended to wait until the brachycephalic patient is fully awake and swallowing to remove the endotracheal tube, however some patients experience excitement and agitation from the ET tube. Work together with your team and doctors to determine the best extubation strategy for the individual patient. Brachycephalic patients should be recovered in sternal recumbancy with their head slightly elevated (see photo). By adding a bit of technician time and care, you can make an anesthetic experience the best possible for your brachycephalic patients. Use the following link to see the 2014 AAHA Guideline for Dogs and Cats.